We've shared several articles in in the Home, Yard, and Garden Pest Newsletter about the viburnum leaf beetle. 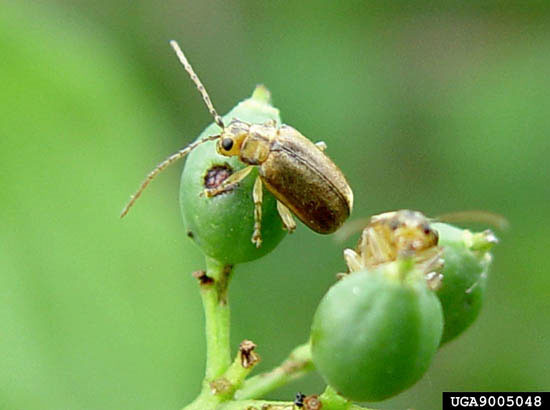 Up until the last 2 weeks, we've only had a couple of isolated reports of viburnum leaf beetle in the state, in both DuPage and Cook counties. Over the past couple of days, several reports of severe defoliation caused by viburnum leaf beetle have come in from these same two counties. Viburnum leaf beetles overwinter as eggs on twigs of the host plant. In May, larvae hatch from the overwintered eggs and begin feeding on host plants. The larvae are greenish-yellow and develop dark spots as they age. They are usually found feeding in groups. Between early and mid-June, larvae drop to the ground and pupate. They remain in the ground for about 10 days. Adult emergence generally occurs from mid- to late July. The adult beetle is small, ¼ to 3/8 of an inch long and is a golden brown color with sheen when in sunlight. Adults will remain active until the first frost. Development from egg to adult takes eight to ten weeks. In late summer and fall, females will begin laying eggs. They chew holes in the bark of twigs to deposit eggs and then cover them with excrement and fragments of chewed bark. A female can lay up to 500 eggs. Despite the severe winter, it appears that overwintering was not affected and this beetle is causing serious injury. This pest has the potential to become a serious problem in nurseries and landscapes. Both the adult and larval stages of the viburnum leaf beetles can be severe defoliators. 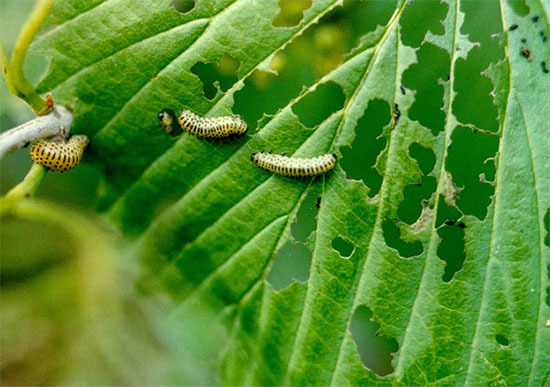 Larvae and adults feed on the leaves, defoliating between the midrib and larger veins. Heavy infestations can defoliate shrubs, cause dieback, and eventually kill the plants. 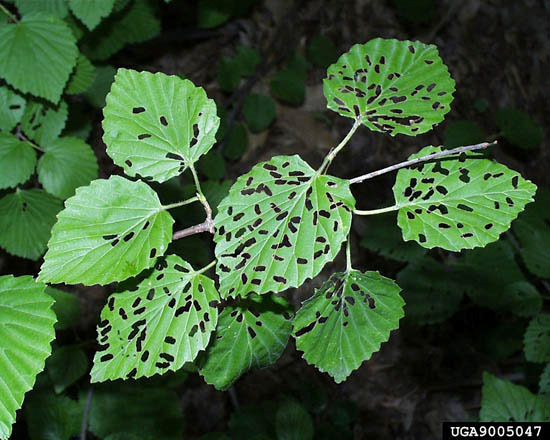 It is the only pest known to skeletonize viburnum leaves. Feeding is limited to species of viburnum. The viburnum leaf beetles have a preference for viburnums with little hair (pubescence) on the foliage, including the European cranberrybush viburnum, arrowwood viburnum, and American cranberrybush viburnum. They also feed on wayfaringtree viburnum, Rafinisque viburnum, mapleleaf viburnum, nannyberry viburnum, and Sargent viburnum. There are several resistant varieties, including Koreanspice viburnum, Burkwood viburnum, doublefile viburnum, Judd viburnum, lanatanaphyllum viburnum, and leatherleaf viburnum. Table 1. Preliminary list of viburnum that are relatively susceptible or relatively resistant to viburnum leaf beetles (compiled by Dr. Paul Watson, Cornell University). Highly susceptible species are the first to be attacked, and are generally destroyed in the first 2-3 years following infestation. Susceptible species are eventually destroyed, but usually are not heavily fed upon until the most susceptible species are eliminated. Moderately susceptible species show varying degrees of susceptibility, but usually are not destroyed by the beetle. Resistant species show little or no feeding damage, and survive infestations rather well. Most species in all susceptibility groups exhibit more feeding damage when grown in the shade. In regards to management options, Cornell has a very helpful management guide for homeowners (http://www.hort.cornell.edu/vlb/manage.html). At this time of year, for homeowners who are experiencing defoliation, the best option is going to be pesticides. It is important to make sure larvae are present and to make a thorough application so the pesticide comes in direct contact with the larvae. Spraying adults or eggs is less effective. There is some information on the use of horticultural oils and insecticidal soaps (http://www.hort.cornell.edu/vlb/newtools.html).